As we approach Holocaust Memorial Day on 27 January, the Centre encourages teacher colleagues, friends and partners to take some time to reflect on the overarching theme of this year’s commemorations: ‘Torn from Home’. To this end, we are delighted to share a selection of writings which have been authored to mark Holocaust Memorial Day 2019. The idea of home is one which, for many of us, evokes strong emotions. In the process of our evolution, such spaces have offered shelter and protection, enabling us to exist within our environments. Building a home, in a literal sense, has therefore been integral to our survival as a species. Of equal importance are the processes of making a home and feeling at home. Here, home is more than simply a physical construction which offers safety and security; it is also a place where we feel comfortable and content, and duly able to live our lives. For these reasons, amongst others, the prospect of having “home” forcibly taken away from or denied to us is something which we instinctively rile against. Sadly, acts of human atrocity such as war and genocide invariably see such things occur. In these cases, something more than places of habitation are destroyed. In the 1930s, the policies of Nazi Germany against Jewish men, women, and children within its borders created immense upheaval, dislocation, and – increasingly – displacement. As a young boy, Lord Alf Dubs experienced this first-hand following the arrival of the Nazis in Czechoslovakia in 1938. A year later, Dubs was fortunate enough to be able to leave the country and find refuge in England under the Kindertransport programme. In this moving piece, especially written for the Centre to mark Holocaust Memorial Day, Dubs reflects upon his personal experience of being torn from home and how it has shaped his concern for refugees today. Someone else who was in Czechoslovakia at the same time as Lord Dubs was Bernd Nathan, a German Jew who had left Berlin in 1933 and re-settled in Prague, believing he would be beyond the reach of the Nazis. Though this did not prove to be the case, whilst in Prague Bernd met his future wife, Anka, a law student at Charles University. The pair married on 15 May 1940, and just over a year later, were among the first transports sent to the Terezin/Theresienstadt ghetto in Czechoslovakia. The story of Bernd and Anka, a newly-married couple torn from their home, is today regularly re-told by their daughter, Eva Clarke – herself a Holocaust survivor, having being born in a railway cart en route to Mauthausen concentration camp on 29 April 1945. To commemorate Holocaust Memorial Day, Eva has written these recollections on her parents’ wartime experiences and her and Anka’s return in Czechoslovakia after the war. Poignantly, Eva recounts how Anka, on returning to Prague, was confronted with the brutal reality that all that she once called ‘home’ had since been utterly destroyed. In the process, the trauma and rupture of initially being torn from home had only been intensified by the destruction of the very idea of home. In deepening our awareness of the experiences like Lord Dubs, Anka and Bernd, and Eva, we move towards developing a more rounded understanding of the human consequences that flow from persecution, discrimination, and genocide. In so doing, we also deepen our knowledge of what these phenomenon are and what they entail. Someone who has worked tirelessly towards such ends is Gregory Stanton, whose model outlining the stages that genocide commonly proceeds through has – regrettably – been borne out in reality on more than one occasion. 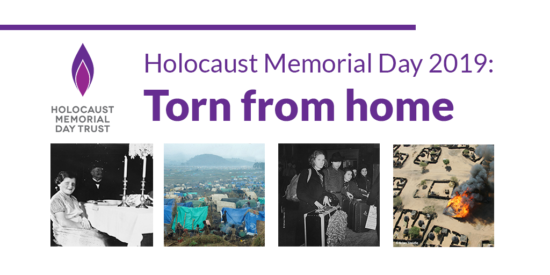 As we approach this year’s Holocaust Memorial Day and consider its theme ‘Torn from Home’, the Centre is both privileged and honoured to share the reflections of Lord Dubs and Eva. In sharing their insights with us, these pieces also touch upon some of the elemental challenges that the Holocaust and its legacies continue to pose us. One man who lived with the reality of these issues was the British Holocaust survivor Leon Greenman, who sadly passed away in 2008. In the years since, the story of Leon and his family has become a keystone in the Centre’s educational programme. Here, the Centre’s Head of Academic Programmes, Ruth-Anne Lenga, reflects on terrifying moment he and his family were torn from home and points to how teachers and young people have wrestled with this traumatic moment. From our research and our experience we know that the accounts of survivors like Leon can have a profound impact on students, and can serve as a vital resource for teaching and learning about the Holocaust. Today, a growing number of schools choose to pursue Holocaust education through a whole-school approach – with Holocaust Memorial Day acting as an important marker in cultivating awareness and participation. The challenges, opportunities, and potential benefits that can come through these approaches are discussed in this final piece by George Croxford, Headteacher of Royal Wootton Bassett Academy. As George shows school leaders have an important role in marking Holocaust Memorial Day, especially in our Beacon Schools. His school-based reflections speak to the sometimes difficult relationship of commemoration and education, but demonstrates just what Holocaust Memorial Day can to focus a school community and enhance provision and practice. *The UCL Centre for Holocaust Education will be marking Holocaust Memorial Day in a small ceremony on 24 January.